Stanton Macdonald-Wright described the mural project’s origin, execution, subject matter and themes in a catalogue prepared for the unveiling of the library mural on August 25, 1935. The original catalogue (Macdonald-Wright, S. Santa Monica Library Murals. Los Angeles: Angelus Press, 1935) is part of the Main Library's California reference collection. A scan of this catalogue can be downloaded as a PDF (see link at right). The murals for the Santa Monica Library were started Feb. 8, 1934, under the P.W.A.P. and finished under the S.E.R.A. One thousand and thirty-five dollars was raised in open meeting by the city government under Mayor W. H. Carter and by private subscription by the citizens of Santa Monica. It was understood that the murals were to be dedicated to Archibald Davenport Wright, the father of the artist, and to the City of Santa Monica. Two technical helpers were allowed the artist by the P.W.A.P. These men were absolutely necessary due to the extent of the work to be done and the time allowed the artist in which to complete it. Henry Hibbard and Fred Bessinger made all measurements; a difficult work in itself, due to the irregularity of walls and the lack of regular degrees of arc on the alcove entrances, etc. When it is taken into consideration that the entire mural was painted on five-ply white pine panels four feet by ten, which had to be dowled and joined so that the seams would be invisible, the necessity for technical perfection becomes more evident. This work was done in the artist’s studio by Mr. Hibbard and done so well that the greatest deviation was one-eighth of an inch in an extent of seventy-three feet. The preparation of the wood was completed by Mr. Bessinger; a preparation of refined white lead and imported sun-bleached linseed oil. In exactly eighteen months the work was ready for installation and the day of unveiling set for August 25, 1935. The subject matter was chosen by the artist and no help whatever was had in the actual work of painting. The labor on the installation of the murals was all from the S.E.R.A. and furnished by Bernard Roufberg, the business manager under P.W.A.P. and the director of the art project under S.E.R.A., who had been of invaluable assistance to the artist from the inception of the project. Technical work was furnished at the expense of the City of Santa Monica. The subject matter may be described as depicting the two streams of human development: one technical, the other imaginative. They coalesce and fuse in what perhaps holds the greatest potentialities for art expression invented by man – the medium of the moving picture. Those who have been in a moving picture stage and laboratory during the filming of a picture know what a great role the inventions along the lines of precision machinery, chemistry, and electricity, play in the process. Opposite the entrance and among the first pictures that meet the eye is the group placed under the alcove arch. This entire group is a sort of prologue, and depicts the technical and imaginative pursuits of primitive man. Toward the left is the invention of the wheel, which with the invention of fire, was probably the first epoch making invention of mankind. 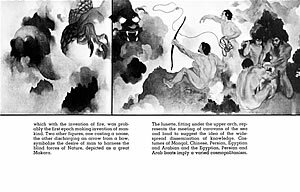 Two other figures, one casting a noose, the other discharging an arrow from a bow, symbolize the desire of man to harness the blind forces of Nature, depicted as a great Makara. The lunette, fitting under the upper arch, represents the meeting of caravans of the sea and land to suggest the idea of the wide-spread dissemination of knowledge. Costumes of Mongol, Chinese, Persian, Egyptian, and Arabian and the Egyptian, Persian and Arab boats imply a varied cosmopolitanism. The beginning of the mural proper has its place above the lunette. As practically all our mechanical and technical development has had its inception in the Occident, Hellenic and Egyptian deities are used, for as Egypt was the sire of Hellas and Hellas the sire of Rome and Rome our own classical antiquity, these deities and all they imply were the culture impetus of the Occidental temperament. The first group (proceeding always toward the left) is composed of Aristotle (384-322 B.C.) and the young Alexander (356-323 B.C.) (his pupil), Zeno, the founder of the Stoic school of philosophy, and Socrates (cir. 470-399 B.C.). The fantastically limbed tortoise and Achilles refer to the strict logical progressus exemplified in Zeno and his contemporaries, a logic that is based but little on experiential observation and much on pure intellect. Such pure thought may be considered the basis for abstract mathematics, as well as representing Occidental man’s necessity of giving himself rational answers to irrational questions. Group No. 2 – Roman engineering work. The aqueduct depicted is the Pont du Garde at Nimes, France. Group No. 3 – Roger Bacon with an assistant. Roger Bacon (cir. 1214-1292) was the first great experimentalist in natural science and chemistry. He wrote on light reflection, tides, time, the possibility of steam vessels, the microscope and telescope, mathematics, celestial bodies, eclipses, and the composition and effect of gunpowder. His written works comprise Opus Minus, Opus Majus and Opus Tertium. Group No. 4 is that of Copernicus (1473-1543), the real father of modern astronomy. His heliocentric theory overthrew the geocentric theory of the ancients. He was also a great mathematician and wrote the “Six Books on the Revolution of the Celestial Orbits.” To the left in the same group stands Galileo Galilei, the father of Mechanic, the first great experimental philosopher and the discoverer of Newton’s first law of motion. He partially described the second law of motion and showed the way to the third law of motion. He is the author of Sidereus Nuncius and “Letters on the Solar Spots.” He, too, was a great mathematician – discovered the laws of the pendulum and with his own telescope discovered the four moon of Jupiter. Group No. 5 (on the west wall) includes the Marquis de Laplace (1749-1827) and Sir William Herschel (1738-1822). The former is the theorist of the nebular hypothesis (depicted enlarged in the might sky), a master scientist and mathematician, and author of “The System of the World.” Sir William Herschel may be called the first great observational astronomer. 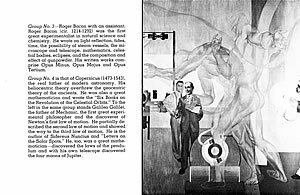 He wrote “Motion of the Solar System in Space.” On the mural he holds a paper with a drawing of the Georgian planet and its satellites. Group No. 7 is a modern machine shop of electrical motors. The two heroic figures symbolize the negative and positive electrical impulses, the push and pull of all electrical current. 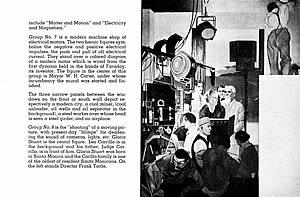 They stand over a colored diagram of a modern motor which is wired from the first dynamo held in the hands of Faraday, its inventor. The figure in the center of this group is Mayor W.H. Carter, under whose incumbency the mural was started and finished. The three narrow panels between the windows on the front or south wall depict respectively a modern city, a coal miner, (coal unloader, oil wells and oil separator in the background), a steel worker over whose head is seen a steel girder, and an airplane. Group No. 8 is the “shooting” of a moving picture, with present-day “blimps” for deadening the sound of cameras, lights, etc. Gloria Stuart is the central figure. Leo Carrillo is in the background and his father, Judge Carrillo, is in front of him. Gloria Stuart was born in Santa Monica and the Carillo family is one of the oldest of resident Santa Monicans. On the left stands Director Frank Tuttle. Returning to the starting point of the mural prologue and proceeding toward the right is seen the primitive artiswt carving on reindeer horn. He is seated by his mate (the family) and beside her is the figure of a young man with two wolf doges (domestication of animals). This group of three shows fear of the monsters that appear in the sky symbolizing the primitive belief in maleficent dieties. Above the lunette and to the right are two oriental dieties—the eagle god of the Assyrians and Siva, the Indian Creator and Destroyer, in his eternal dance. As most of our legends, as well as our imaginative design and our faiths, have come to us from the East, the first figures of Groups (right) 1 and 2 are of oriental figures. Group No. 1 – Confucius, the Buddha and Lao Tzu. These three men even today color the imagination and influence the art of some five hundred million people. Confucius (or Khong Fu Tzu) was a Chinese politico-ethical philosopher of the sixth century B.C. His works are still the greatest classics of China. The Buddha sired the great revolt against Brahmanism at about the same epoch in northern India and his teaching and precepts have caught the faith and the imagination of almost a fourth of mankind. Lao Tzu, contemporaneous with Khong Fu Tzu and the Buddha, interested himself only in the “superior man” and his book of five thousand ideographs, the Tao The King, remains one of the profoundest works of the human mind. whose varied attributes are too manifold for so short a description; Europa and the Bull; Pegasus; the nymph and satyr; and the ghost fires that rise from the steaming ravine. Group No. 3 – Mending the Royal Mosque at Isfahan. The Persian mosque is here used as the great imaginative form of architecture. Group No. 4 – A pastoral scene of the early Renaissance with Boccaccio (1313-1375), whose novelini formed the basis of modern literature, as the central figure. Group No. 5 – Michelangelo (1475-1564) with one of his most famous sculptures – a slave – in the courtyard of an Italian villa. Standing in the fore middle-ground is Dante Alighieri (1265-1321), author of the Divine Comedy, and the inspiration of the greatest artists and sculptors of the Renaissance. The two figures descending the steps are nephews of Senator Jones, the founder of Santa Monica; Mr. Harry H. Gorham and Mr. Robert P. Jones. Both are in Italian Renaissance costumes. Group No. 6 – A bust of Johann Sebastian Bach (1685-1750) above the figures of Beethoven (1770-1827) and Richard Wagner (1813-1883). Group No. 7 – A fantasy of the Rhine operas of Wagner with Brunhilda in the magic fire awaiting the coming of Siegfried. On Siegfried’s right is the god Wotan, and on his left three Rhine maidens. Group No. 8 (south wall – A panel of the Rhine with headland. Panel of the artist’s father, A.D. Wright, at the age of nineteen, as a painter. On the back of his canvas is the dedication of the mural in Chinese ideographs. A panel of a dancer with theatre lighting. Group No. 9 – A panel of famous executants on musical instruments. Samuel Lifschey, viola; Norris Tivin, double-bass; George Barrere, flute; Ugo Savolini, bassoon; Van der Elst, trombone; Carl Heinrich, trumpet, and Josef Franzl, French horn. Karl Muck, famous conductor of the Boston Symphony Orchestra, is conducting. The arch over the front door depicts on the left, Edgar Allen Poe (1809-1849), and on the right, Dr. Lee H. De Forest. Poe inaugurated a new style in literature, the style of the ratio-cinative story, so eminently adapted to the contemporary temperament. He seems so eternally modern that the artist has clothed him in today’s habiliments, set him in a modernist interior and placed behind him in a painted abstraction in the manner of Morgan Russell. Dr. De Forest is the inventor of the audion amplifier, etc., which made possible long distance telephony. He also developed the talking motion picture, the phonofilm. His laboratory is situated in Hollywood. The artist in bringing these two men together has attempted to indicate the technical necessity felt by the imaginative artist and the imagination necessary to the profound technician. All the landscape is of the California coast that stretches for one hundred and twenty-five miles from Santa Monica to the northern limits of the Gaviota Pass, and the shrubbery and trees are native to this same country. There are more than one hundred and sixty figures, of which forty-six are portraits. Santa Monica Library Murals. Los Angeles: Angelus Press, 1935.